An Eco-Friendly bridal shower theme is a party based on the idea of conserving, preserving, and reusing. Doing this on a daily basis is a way to lessen each individual's impact on the environment. Incorporating these ideas as the focal point of your event plans is a "natural" fit. The bride may be very outspoken on this idea. If so, this would be her perfect party theme. She may just go about her daily chores quietly "doing the right thing". Most guests probably already do some kind of recycling, and will think this is a positive choice. The following points are ways to add this concept to any party. 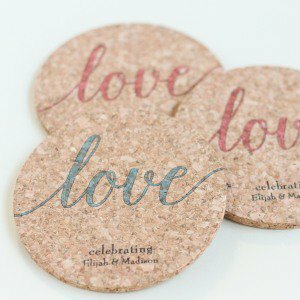 • Use invitations printed on recycled paper. • Ask your guests to contribute their favorite tip. You could assemble all their ideas into a small book for the bride. • Your party location can be outdoors, weather permitting. This saves on heat or air conditioning. Having your party outside, may also give you some natural decorations. • Reuse decorations. You may have these from a previous party, or holiday. See if others involved with the planning have items you can borrow. • Biodegradable rose petals can be used as colorful table accents. • Linens can be used for tablecloths and napkins. Use real plates, cups, and utensils. • Use real flowers in season. You may have some right in your own garden. • Choose bridal shower games to add to the fun. 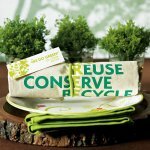 • Eco-Friendly bridal shower theme favors are a logical choice for this party. • Biodegradable bags filled with wildflower seeds are both practical and pretty. • Favor boxes made of biodegradable paper that contain seeds. • Natural cotton bags ready to fill. Gift suggestions: give back to the earth by giving gifts that are natural and environmentally friendly. Choose organic food items for your menu. • Make fresh salsa and guacamole. • Serve a healthy vegetable or fruit punch. • Would you like to see more theme ideas? • Go from eco-friendly page, to Bridal Shower Ideas For You homepage.